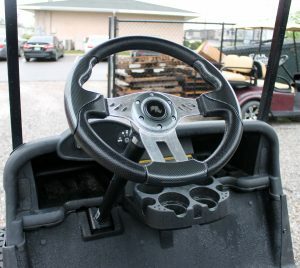 Most golf cart owners are always looking for the next way to customize their golf cart, it can be a very frustrating process for some because there is so many different brands, sizes, colors, and it can all be a little overwhelming looking at all of it at once. That’s what i’m here for, I am going to give you some great tips and ideas on different ways you can customize your golf cart without looking through a one or two hundred page long catalog. 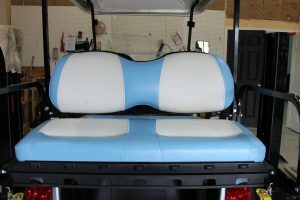 The first way you can start to spruce up your golf cart is by getting some new custom seat upholstery. There are lots of different colors and styles to choose from for example you could get the black and grey carbon color with the sport style, or you could get a solid tan. The solid colors start at $100, and the two-toned seats start at $200. Secondly, you can get some custom accessories, the most common accessories we see people getting is a custom steering wheel and custom dashes. They both are priced just under $100 depending on what you get. They make a great add-on to your golf cart. 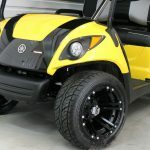 The third way to bring life back to your golf cart is with some new wheels and tires. There are different brand to choose from like MJFX by Madjax, ITP, and SEI. You can get different sizes there is 8”, 10”, 12”, and 14”. 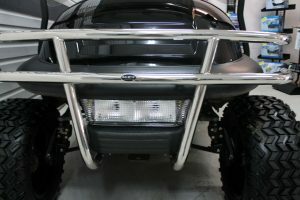 In order to get some of the bigger sizes, you will need a lift kit put on your golf cart. Fourthly, you can get a lift kit. 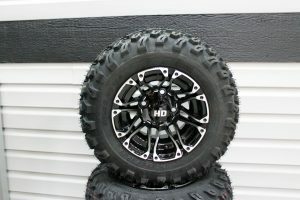 They are a great addition to get for your golf cart, they give you extra clearance to go off road which is good if you use your cart for other things than just golfing, and they give you the ability to get bigger tires. McCulley’s Golf Cars has lift kits available from all major brands for golf carts, including EZGO, Yamaha, and Club car. We have them for gas golf carts and electric golf carts. 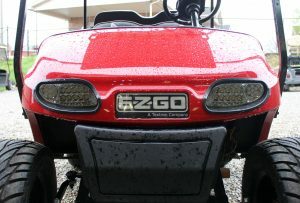 The fifth way you can customize your golf cart is to get some lights, you can get your basic halogen, Basic LED, deluxe halogen, or deluxe LED lights. They make it easier for people to see you at night or if you go through the woods you can navigate your way. Lastly, a great way to feel like you have a brand new cart is by getting a paint job or a wrap. You can pretty much get any color you want or if you are a business you can get a custom wrap to match. A custom paint job starts at about $400. These are a little bit higher cost than the others, but definitely worth it. 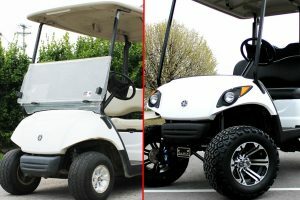 So, as you can see there is plenty of way that you can customize your golf cart. Some more expensive than others, but all are worth it if you are wanting to customize your cart to fit you. I hope that my information helped you. If you have anymore questions regarding customization comment below. We Would love to answer them and hear your feedback.